“Quit being such a basket case.” “Keep it together, you’re being a basket case.” Whenever you’re having a moment where you just lose it, the phrase “basket case” is sure to follow. 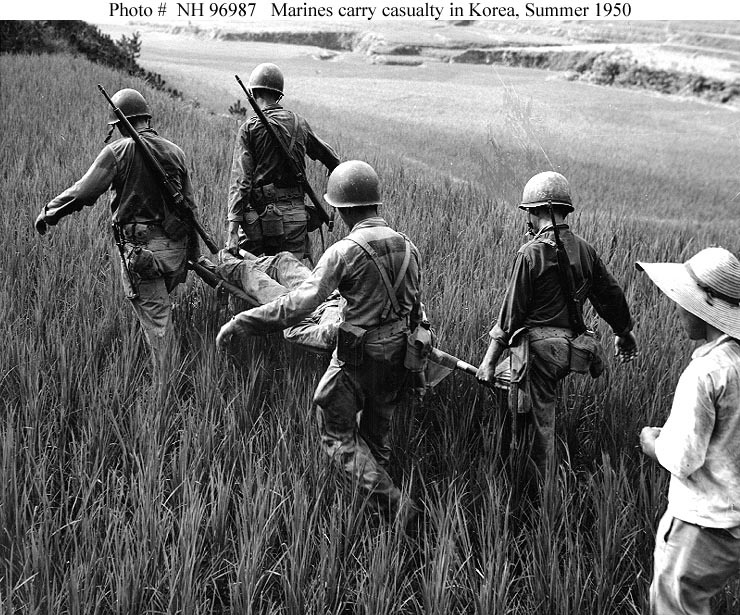 An example of someone who would be a “basket case” — Marine stretcher bearers carry a wounded Marine from the front lines to a forward aid station in Korea, circa August 1950. The term “basket case” originated during WWI. (Official U.S. Marine Corps Photograph, from the “All Hands” collection at the Naval Historical Center via www.history.navy.mi). Surprisingly, its origin stems from the military, and was never intended to define a crazy moment. So where did it come from? According to Judy Parkinson, author of “Spilling the Beans on the Cat’s Pajamas,” the derogatory slang term normally used to describe a mentally-ill person or a person unable to function properly, originated in the military around World War I. It was a slang for soldiers who had lost both arms and both legs, “and because of this, needed to be carried in a basket by others,” Parkinson says.